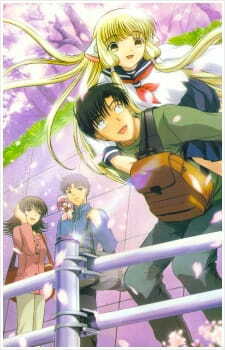 Chobits mixes your typical sci-fi genre into a romantic comedy anime with an interesting concept of personal computers that look human in appearance and have their own personalities. The concept is great but how does it play out in the series? I found Chobits an interesting concept to be adapted into an anime. Not many other anime have combines sci-fi computer humanoids with everyday real life events that trigger romance and comedy in one package. Chobits somehow delivers that package and presents it pretty well. So basically, the story is set in the future where personal computers are human-shaped and are called 'persocoms'. Obviously, these 'persocoms' are restricted to the amount of programming built into it, but somehow, the main character find a special 'persocom' named 'Chi' in the trash. Why you may ask? Well, you will find the answer towards the end of the series. However, the interesting events only happen towards the end, before that, you will have to put up with some slow-pased introductions and every life commotions. Oh did I tell you, that 'Chi' has no recollection of any memories? Well, the first half of the season, you will be watching the main character teach 'Chi' all sorts of stuff about everyday life. Sounds interesting? Not really. Although some parts were funny, but in the end, the first half was a bit slow. The art was well illustrated throughout the whole anime. The characters were stunning visually. The many places and sceneries throughout the anime were just drawn to perfection. You will not get annoyed at any character throughout the anime and the 'persocoms' do look cute with their electronic ear sockets. 'Chi' just looks so human and natural which makes it even more aesthetically pleasing. Sound was above average in my opinion. The theme songs were nice but weren't that memorable. Let me talk about the voice acting. For the first half of the series, you will constantly here 'Chi' say 'Chi!'. Serious. When the main character first found her, all she could say is 'Chi' (that's how she got the name). It can get a bit annoying after a while since 'Chi' is constantly saying 'Chi', but she does learn to speak as the anime progresses along. Moving on, the other characters voice acting was well done. I have probably already lightly touched on the character's personalities and style from before. We all know how 'Chi' is and what she does. Overall, the other characters were quite different and memorable. Each having their own sad stories to tell (whether 'persocom' related or not). It can be said that the characters to become a bit dramatic and melancholy, but you would expect that from a drama, right? Overall, I really enjoyed this anime. Maybe because I am a sci-fi fan and I do love the occasional romantic comedy element thrown in. I don't know why other people don't really like this anime, perhaps getting it on with a 'persocom' isn't really a great idea and would create lots of problems. Which is basically the central theme this anime is based upon. If computers became like humans, what would happen to the world? Slow start but gets fast-pased toward the end. If you can't stand every life anime then this may not be for you. Also, if you think loving a 'persocom' is weird, then this is definitely not for you either. Loved the artwork, the scenery, backgrounds and characters. Really well illustrated and animated. Soundtracks were nice, although not that memorable. 'Chi' can get a bit annoying sometimes. Humans and 'persocoms' living together, which creates many problems. As you will see with the many characters throughout the series. It was both funny and sad in many aspects of the series. All I can say is that this anime is full of mixed emotions. Love, hate, envy, jealousy, sadness and much more. Falling in love is complicated. Falling in love with a supercomputer is a whole different story. The anime was fun to watch and if you like sci-fi romcoms, then this is for you. Does anyone still play Angry Birds? Has the fad gone down? Perhaps not for Rovio as they release yet another spin-off of Angry Birds set in space. Angry Birds Space was released today and it is now available on the Google Android and iOS platforms.The game boasts over 60 interstellar levels for you to try your aiming skills, and you can be sure that the new cosmic backdrop will pose some fun challenges. Among other twists, the sequel to the original Angry Birds mega-hit requires you to take into account the lack of gravity, as you navigate the restraint-challenged birds to planets, stars, black holes, and what not. Angry Birds Space also features brand new birds with various super powers. All your favorite angry fowl are making a comeback, along with a newly introduced extra-terrestrial Ice Bird that can turn anything it touches into ice. Because that just makes sense! You can download it from the Google Play Store for free. Are you gonna play Angry Birds Space?